Lt. Col. Karen J. Wagner – Where Is My Spot? By September 11, 2001 Lt. Col. Karen Wagner had been in uniform for 17 years, however with growing up in a military family and ROTC while at UNLV, she’d really been serving for much longer. 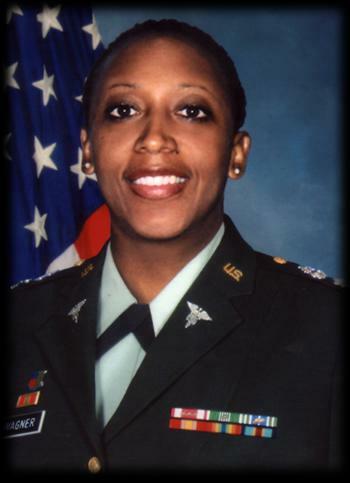 Although she’d just accepted a promotion to Deputy Chief of Staff in the Army of the Army Surgeon General, she was already looking into what she would do with the next chapter of her life. Wagner’s many Army postings included serving as adjutant for the 85th Medical Evacuation Hospital at Fort Lee, Va.; executive officer and company commander of D Company in the 187th Medical Battalion at Fort Sam Houston in San Antonio; and chief of personnel for the 57th Evacuation Hospital in Wuerzburg, Germany. She also headed the personnel services branch at Walter Reed Army Medical Center in Washington. According to her sister, Kim she spoke often of teaching overseas. But quietly, the two of them used to dream about hosting a television cooking show together. Athletics had long been part of her life. She liked to relieve stress by taking long run sand while at UNLV she played guard on the university’s women’s basketball team. She made strong connections with people, especially children, her sister, Kim, recalled. I meant to write to you, dear Karen Wagner many times , to let you know that I did feel what you went through14 years ago among other heroes.I had a premonition a month before , I couldn’t understand the terrible sadness of touching the America Flag I found 32 years ago on the streets of Fl., all dirty next to Bible..I’m carrying your name on my left wrist on a silver metal since you all 3000 some move to heaven,; I needed to tell you that at the same time my grandson Ethan JB was born. Yeah he is 14.